What toys will help my toddler talk, learn, problem solve, and play? With the holidays around the corner, I know many of you are thinking, “I don’t want to waste money and buy just any trendy toy or character piece that my toddler will play with once then disregard. How can I choose a toy that will get repeated use and build these skills in my toddler? Well, you’ve come to right place. Amazon affiliate links included. Thank you for your support! Over at Scanlon Speech Therapy, I’ve also included toy and game recommendations for children in preschool and up. Select toys that do more than one thing. If you are on a budget or are embracing a minimalistic approach to toys, I highly recommend toys that can be used multiple times in many different ways. Nesting and Stacking Blocks are a perfect example. Children can do all sorts of things with blocks. 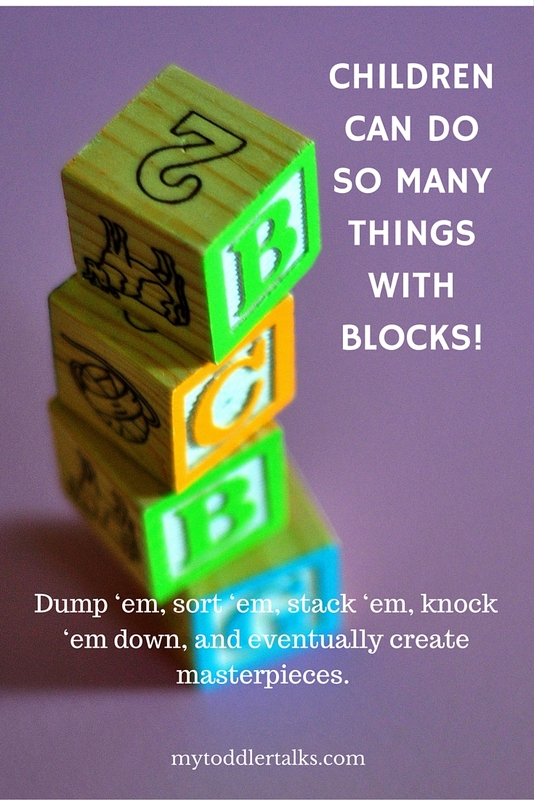 Dump ‘em, sort ‘em, stack ‘em, nest ‘em, knock ‘em down, and eventually create masterpieces. In my experience, toys that require manipulation to produce a result (e.g. Jack in The Box or a large spinning top) or create change (e.g. Y happens after X like B. Whacky Ball), or have multiple parts (e.g. Mr. Potato Head and shape sorters) will propel that sense of exploration and curiosity. Are intrinsically motivating and interesting. Please click the image below to download a free PDF to help you select an appropriate toy for the special child in your life. Select a few toys or activities your toddler can play with somewhat independently without too much assistance from you. Puzzles, doodle pads, and Window Clings are good examples. Large serving spoons, utensils, kitchen Tupperware, empty cardboard boxes, or a collection of empty paper rolls are also fun! Why not wrap some random FREE, household objects and put them under your tree? Opening the gifts are half the fun anyway! Depending on your child’s skills and developmental level, it’s also wise to purchase some toys that enhance make believe, promote role playing, and develop sequential thinking. Large dollhouses, Jumbo Cardboard Blocks, and Kitchen Sets are toys that will assist in developing these skills. Ever wonder why public sandboxes, swing sets, slides, and playgrounds are so popular with young children? The larger the play items the better chance other children will want to join in play! I have met many toddlers that really like playing with my car wash set. The children who enjoy this set the most are those who know what a car wash is and or have gone to one. The point is, children want to play with toys that make sense to their life experience and recreate or extend those events. A child who has never been to a car wash may not understand a miniature car wash play set, even if you explain it to him. He needs to have an experience to compare it to. Toddlers are strong and sometimes clumsy. Pass on the iPad, even if it’s in a great case, and select toys that can survive being dropped, crushed, stepped on and pulled apart. Don’t feel pressured to buy toys or gifts that you can’t afford. If your child is still putting everything in his mouth, read the labels and find out where the toys are manufactured. Stay away from toys that contain magnets and are brightly colored as they may contain lead paint. Check out the Consumer Product Safety Commission for the latest recalls. I hope this list has been helpful!! If you are in need of some additional free and helpful resources, please subscribe to my newsletter – I share more information and worksheets with my newsletter subscribers.